This week we had to produce our own 'Cabinets of Curiosities' - either evoking the early collectors and museums that sought to inspire awe - or the later collectors like Cornell, Warhol, Dion, that were more iconoclastic and rebellious in their Collecting - and in their curating. In the process we were also exploring the nature and pleasures inherent in collecting - and that was supposed to emerge in our reflective critical commentary. As Cabinets have the potential to tell so many stories - set exactly this task for your own students. Get them to design and make their own Cabinets - may be just in a match box or an old CD case - it does not have to have a large scale to be effective. This task could be set in the first week of a long course - with students presenting and discussing their Cabinets in the second week. This would then act as an extended ice breaker, as an exercise in creativity - and as practice in critical and reflective thinking. 1. Explain your process (medium and technique). How was it made? Which art materials and approached did you use and why? This Cabinet could be said to have been influenced by all the (20th and C21st collectors that we studied: Cornell, Warhol and Dion. I built this Cabinet in what we call the ‘front room’ in the UK (other names have been the parlour, the receiving room, the reception room) – basically it is the main room of the home - the 'status' room. I wanted to create a Cabinet that reflected my love of the seaside – and that also challenged traditional notions of what is appropriate decoration for such a room; and what it is appropriate to collect, cherish and display. The 'cabinet' itself is not made from oak or mahogany or even of proper pine - it is literally 'bodged' - made from wood still wet, that then dried and changed shape in the drying. In the process, gaps appeared between planks - and nothing is 'perfect'. Thus the Cabinet itself is a small social commentary - refuting refined woods and artistic carpentry - and celebrating the rustic and homespun. 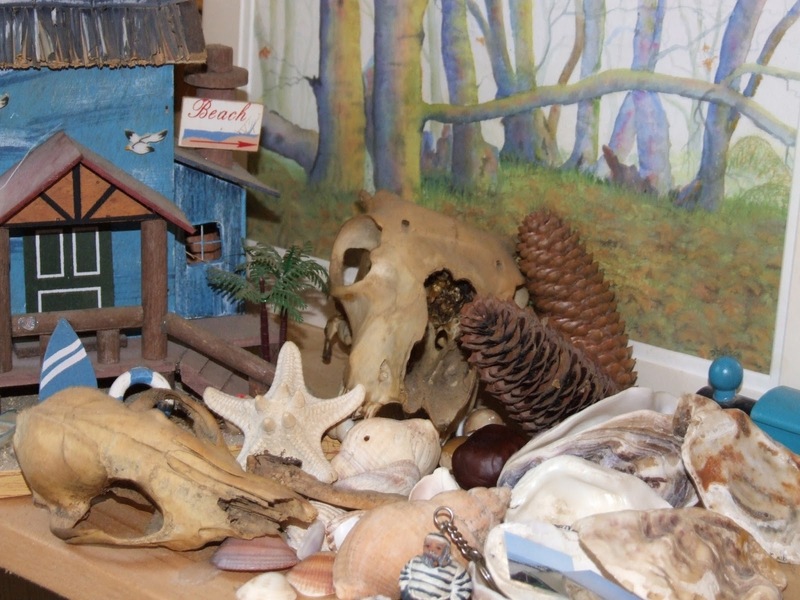 It is definitely not the sort of Cabinet or display case that you would expect to find in this sort of room - nor is it the sort of case that would normally be used to display your most cherished possessions. Typically the front room is a formal room with formal decorations: it can be the ‘statement’ room of the house that tells people who you are and what you value. In a capitalist, wealth-obsessed society, it can be the space where you display your wealth though the objects you collect and display. It is where you tell people about your status – and your ‘taste’. We divide ourselves one from another by wealth, status and taste… Ornaments can be purchased to decorate this room – and are usually expensive. Similarly art work may be displayed in such a room and as with the art work in a gallery or a museum – it is also formal and produced by named artists – or could be copies of works by named artists. Cornell, Warhol and Dion wanted to challenge the formality of museums, the taxonomy and classification systems themselves, all the rigidity inherent in galleries and in curation. They wanted to challenge what is considered worth displaying – and how it is displayed. In the process of creating their Cabinets they produced their own art works that were interesting, curious or beautiful in and of themselves – but that also challenged the status quo of curation – and even of society and its values. 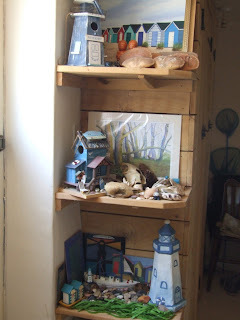 In just this way I wanted to create my own Cabinet - I wanted it to evoke the beauty of the seaside - but also to comment on taste/wealth/society. 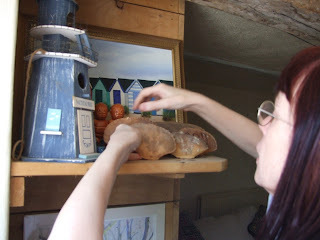 I created my representations of the seaside by placing found objects from the seaside itself – rocks, shells and crab shells – alongside ‘cheap’ art or mass produced art – or art made by family and friends, or given by family and friends… and challenge what is acceptable to display in a formal front room – and what ‘good taste’ is. 2. Describe the idea behind your artwork. What story or message does it get across? What does it mean to you? The simplest idea behind my art work is that is an evocation of the natural world – especially that found by the sea – with an emphasis on the UK shoreline. It is designed to evoke the sense of a place that I find beautiful – the Kent coast - and many of the shells and stones displayed there are from that coast. Having a watercolour of a forest in one of the layers of my cabinet also evokes the Norfolk coast that I used to visit with my friends so many years ago. In that part of Norfolk the trees go right to the edge of the sand dunes near the sea – and also the friend that I used to visit there is the friend who bought me that watercolour as a present. I have placed skulls amongst the seashells for I find these beautiful – but I also like the juxtaposition of life, the sea, and death, the skulls themselves; that is the fate of us all. 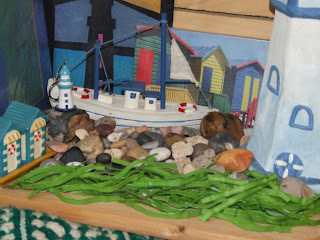 The boat, the pictures, and various items there were given to me by family and friends as they know my love of the seaside. The items tend to be not expensive, perhaps mass produced – but beautiful for all that; beautiful also for the love with which they were purchased and given to me. 3. Why did you create it? What are your reasons for creating that specific art piece? What do you want your audience to feel and think while observing it?